The Gay Gamer: Happy Thanksgiving! 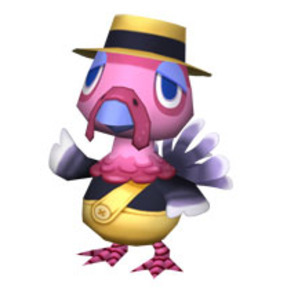 To all of the American gamers who visit this site: Happy Thanksgiving! I know you're going to eat for most of the day, but are you going to play a few games too? I am! I'm going to start with Kirby's Epic Yarn, I think, and then switch over to Animal Crossing: City Folk. Fingers crossed that I'm able to fulfill Franklin's (above) need for silverware while I also rid my town of all the weeds that (surely) have popped up since I last played the game. Yeah, now I'm trying to get golds on every stage, and make sure I've found all three treasures on every stage. I had a dream about Kirby's Epic Yarn last night...it was...cute. That's very appropriate, Justin. Can't wait until you get to play it!